Asian Szechuan chicken is so delicious, It is hot and spicy. You can make your own Asian take-out in the comfort of home with less than 20 minutes. Fast and super easy recipe perfect for quick dinners. This recipe is a boon for the surprise guests or for a large gathering. As I have already discussed, this recipe does not take much time to prepare and cook. All that required is you should have the ingredients handy and ready. 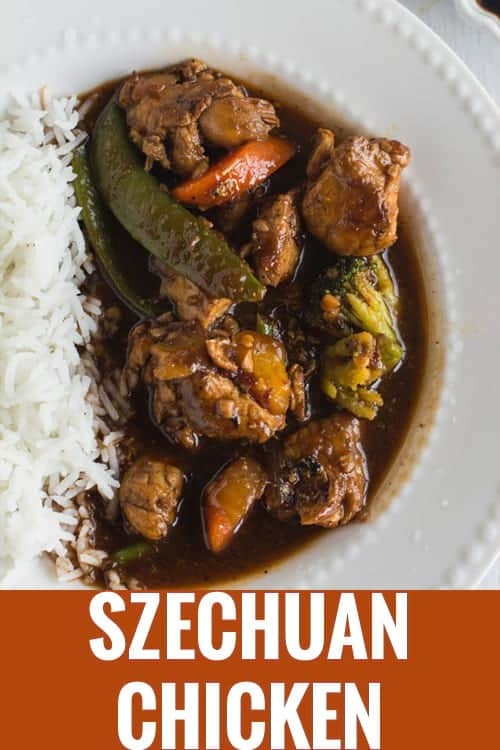 Szechuan recipes belong to a province in China known for its spiciness. And we customize it according to our resources and availability of the ingredients. We love these Schezuan recipes because of its right combination of hot and sweet. The base of this recipe is the Szechuan sauce, which is easier to make. You may make it whenever you need or you may also buy the readymade Szechuan sauce available in the market. If you are searching for other Chinese recipes, then you may look into Tofu Steak, Best Vegetarian Wonton, Teriyaki Chicken, Mushroom Vegetable noodles. Chicken breast meat is great for making this recipe. Marination is optional, but I feel marination make the chicken more flavorful. Vegetables are also optional but we feel the vegetables adds crunchiness and more colorful. Like any other Chinese recipes, this recipe also takes lower time for making. the recipe requires Rice vinegar, and some of my readers ask for the substitute for rice vinegar. The rice vinegar brings unique and beautiful flavor to the recipe, and I do not find any equivalent substitute so far. If I find any, I will update this recipe with its perfect substitution. Adjust the chili paste according to your taste. 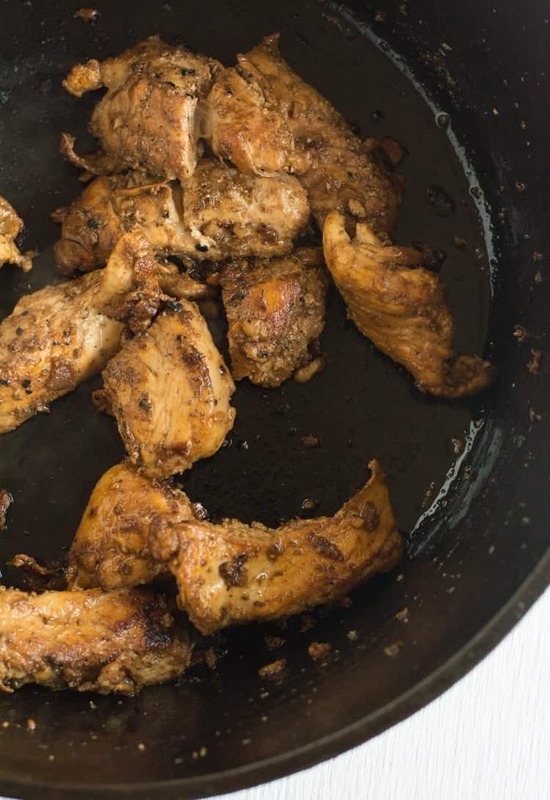 To the chicken marination, add 3 tbsp of soy sauce, rice vinegar, and salt and allow it to marinate for 30 minutes. To make the Szechuan sauce, In a small mixing bowl, add 4 tbsp of low-sodium soy sauce, 1 tbsp of chili paste, 1 tbsp of rice vinegar, 1 tbsp of cornstarch. Combine all these ingredients and set aside for the later use. In a heavy bottomed pan, add 3 tbsp of cooking oil and followed chopped garlic and then by the marinated chicken. In the medium to high heat, fry them until the chicken gets cooked. Now add the vegetables and saute for a minute. Now add the kept aside sauce and bring it to boil. Switch off the flame when the gravy starts thickened to your required consistency. 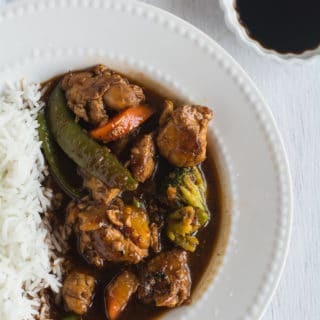 Serve hot along with white rice. Asian Szechuan chicken is so delicious and spicy. 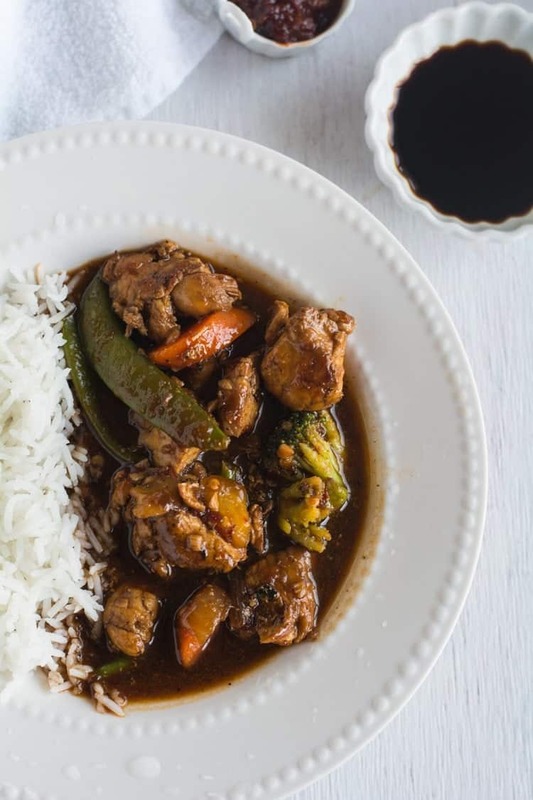 You can make authentic Chinese style dinner in less than 20 minutes. This easy sauce is best with noodles, pasta and lo mein. Made with vegetables like green bean, broccoli and red peppers. Marinate the chicken for 30 minutes with 1 tbsp of Soy sauce and 1 tbsp of rice vinegar. To make the szechuan sauce, in a mixing bowl, add soy sauce, chili paste, rice vinegar and cornstarch. Combine all the ingredients. In a heavy bottomed pan, add 3 tbsp if cooking oil and chopped garlic. Saute them for a minute. In the medium to high heat, add marinated chicken and cook until they done well and perfect. Add kept aside sauce and bring it to boil. Once the gravy reached its required consistency, switch off the flame and serve hot. I also love this chicken dish. Have you ever used Sichuan pepper in this dish? I toast and then crush it into a powder. Sichuan pepper (not really a peeper) gives your mouth a numbing feeling, so you can really spice down. Yeah, I use them often in my kitchen. But in this recipe, I really wanted to minimize the ingredients. And I avoided using Sichuan peppers as it may not be available to many of my readers. Thanks for noticing it and very glad you loved this recipe.